The Suffragette Scandal was the last book for the Brothers Sinister series, but she added one more novella to finish it off. 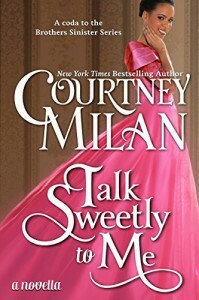 I do give Courtney Milan a lot of credit for having a black protagonist and feature her on the cover which I do not see often in historical romance (granted, I haven't read everything). I really liked Rose Sweetly, the aforementioned lead. She's an amazing mathematician and studies astronomy as much as she can as a woman in the late 1800s. Which is to say she gets to be the calculator. I liked the overall story, but just not as much as the previous books and novellas in the series. Still good and highly recommended.